This recipe is particularly special to me because it was my grandmother’s recipe and one of just a few I’ll be able to share. As it is, I’ve had this passed on to me by my mother and my aunt, because I wasn’t into cooking when my grandmother was alive and I didn’t learn her recipes from her directly. Although my mother and aunt learned to cook from her, they’ve made many dishes their own with tweaks along the way, and it’s hard to remember how she did things originally. 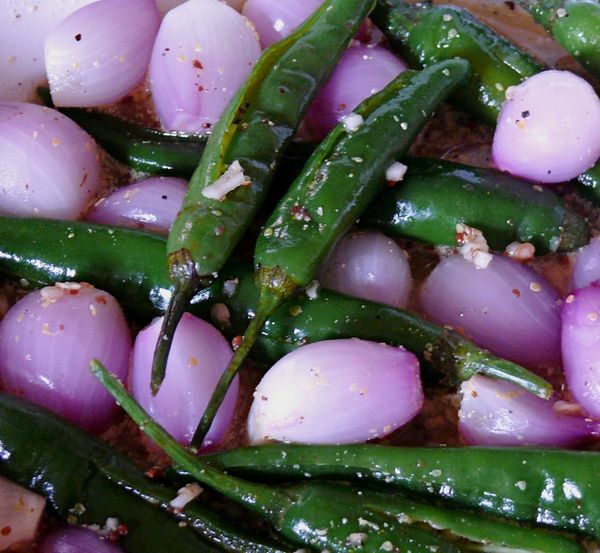 But her pickled chilies and shallots were so loved by all that we try to get as close to recreating her recipe as we can. Somehow hers still tastes better in my memory, although we don’t think we’re doing anything differently. As with most pickle recipes, there’s really nothing to this one except to make the brine and let time, salt and acid do their work. And to be diligent about keeping everything very clean. My family goes through a small batch quickly whenever it’s on hand, so they’ve never bothered to jar the pickle for long-term preservation. The instructions below do not include jarring so you can’t keep them indefinitely. On the other hand, you don’t need to wait that long to eat these either. They may taste better on day 6 but they taste pretty good even after a couple of hours in this brine. You can add other vegetables if you’d like—I remember the odd cauliflower florets or julienned carrots at times—and you could also sweeten the brine with a pinch of sugar, which is how my mother likes it. I like it without sugar, just how my grandmother made it, but again, I’m keen on making this recipe as if she was standing over me to teach me. 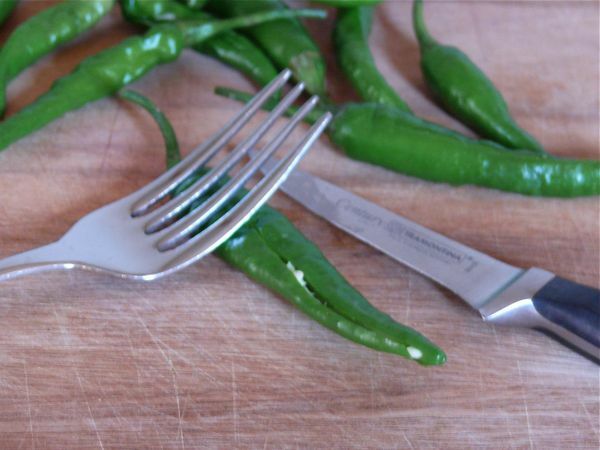 This tip, however, is mine: don’t touch the chilies after blanching them if you don’t have to. The recipe calls for splitting them down the middle which allows the brine to penetrate them and it also looks nice. But you have to handle lots of chilies firmly to do that and to avoid getting those vicious juices all over my fingers, I press the top of the chilies against the cutting board with the back of a fork and them cut them with a small, sharp knife. Sounds way fussier than it is, and one fingertip-to-eye error and you’ll know why it’s worth it to use caution. Looks so yummy, love the purple and green combo! I know what’s missing – her love!